CACZ was founded by The Alliance for Children Everywhere (ACE), a Tucson based non-profit organization. ACE continues to be the major donor of CACZ. Over the past nine years, the program has grown from providing formula to young orphans into a more comprehensive approach. Through a new 18-month grant from the Amway Corporation, Sturtevant and a faculty and student research team have collected new information about not only “Milk and Medicine” but also the introduction of Amway’s NUTRILITE Little Bits, the first and only micronutrient supplement for malnutrition enhanced with plant nutrients, into the diet of the children. Other enhancements include food and support services being provided through local churches and other agencies to extended families so that the young children can stay in their homes instead of institutions. Bethany Christian Services has become a partner of CACZ and Helen DeVos Christian School provides an educational option for children who had none—and with it a hope for a better future. “We’ve discovered that the hallmark of this is the holistic approach—the support for families, the involvement of faith-based organizations, and the concern shown by the staff of those organizations,” Sturtevant said. Detailed analysis of the information the team has collected is still to come, but Sturtevant noted that it’s already clear that the comprehensive approach is making a greater difference than the provision of formula in isolation. Sturtevant’s involvement in the project reflects her long-term emphasis on child welfare abroad, work that has taken her to Romania, China and Central America in addition to Africa. 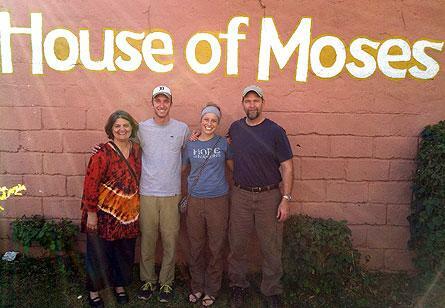 She and Hope students who work on the project with her have visited Zambia multiple times through the years, most recently this past May. In addition to Sturtevant, the research team that visited Zambia for this spring’s data collection included Dr. Dennis Feaster, assistant professor of social work; senior David Blystra of Holland; and junior Samantha Hartman of Plainwell. Junior Courtney Schmidt of Lowell is working with the research team for her Mellon Scholar project on infant and maternal health in Zambia.